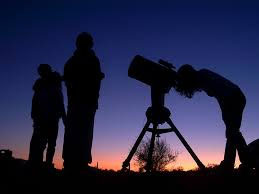 Stargazing is a fun family activity — especially when you can see a comet together! Astronomers have high hopes for a new comet called “Comet ISON,” which is predicted to reach peak visibility in late November and into December. Although predicting how bright a comet will appear is notoriously difficult, we may be in for quite a show! Below we discuss how you can view the comet. Assuming the comet makes for an interesting site in the night sky, it would help illustrate how the Sunjammer solar sail will be propelled through space, carrying your star’s name on a mission that could last for millions of years! Comet ISON was discovered last year by two Russian amateur astronomers working with the International Scientific Optical Network (ISON). It’s a “new” comet in that it has not visited the inner solar system before. The current predictions are that the comet will become visible through binoculars in November, and possibly become as bright as the planet Venus as it approaches the Sun in late November. (Venus is the bright ‘star’ you can see now in the western sky at sunset.) Depending on what happens as it rounds the Sun in late November, Comet ISON could be seen with the naked eye through early to mid-December. 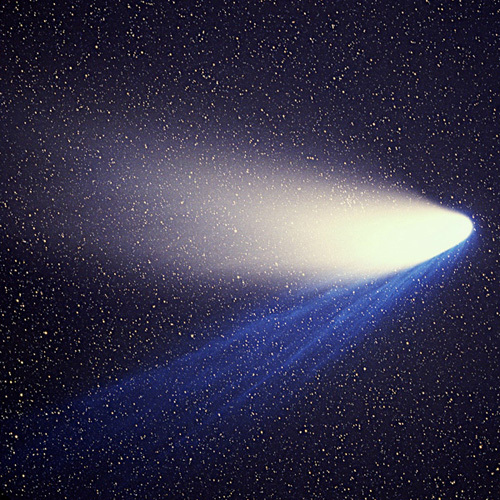 As we see with the beautiful photo of Comet Hale-Bopp above, comets often have two “tails.” The blue tail of a comet is composed of charged atomic particles stripped away from the comet by radiation from the Sun: The blue tail points directly away from the Sun. The white tail is composed of dust particles that are about the same size as the particles found in cigarette smoke. These dust particles are blown off the comet by the physical pressure of sunlight. That same force will propel the Sunjammer solar sail on its journey through space. Because the pressure from sunlight is relatively weak, the comet’s dust particles end up forming a diffuse, curved tail. Both the blue and dust tails may extend millions of miles/kilometers into space. Comet ISON will make its closest approach to the Sun on November 28, 2013, which is Thanksgiving Day in the United States. The comet will fly just 730,000 miles (1.2 million kilometers) from the Sun’s surface. By comparison, the average distance of the Earth from the Sun is about 93 million miles (150 million km). So at less than 1 million miles distance from the Sun, Comet ISON will be up-close-and-personal with our massive star! And if you’re a comet, you don’t want to tangle with the Sun: The Sun’s radiation could boil away much of the volatile material in the comet (such as water), and the Sun’s strong gravity could conceivably tear the comet apart. No one knows exactly how the comet will fare as it whips around the Sun, and so no one can really tell how bright the comet will appear in the following days and weeks. Again, it’s possible the comet could become as bright as Venus this month. But if it doesn’t grow that bright, you could use binoculars and/or the Internet to view the comet. You should be able to view the comet through binoculars in the days leading up to its late November encounter with the Sun. But be very careful not to view the Sun through binoculars or with your naked eye: You could suffer serious damage to your eyesight! The comet will appear very near the Sun shortly before sunrise. So consider viewing the comet through the Internet. As the comet approaches the Sun, we recommend viewing the comet via the webpage for NASA’s SOHO solar observation mission at http://sohowww.nascom.nasa.gov/data/realtime-images.html. 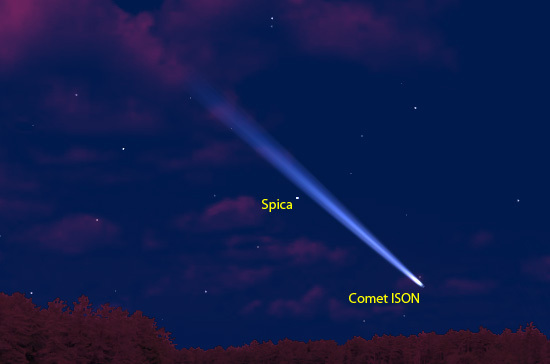 View from the Northern Hemisphere of Earth (North America, Europe, Asia…): Comet ISON shortly before sunrise, over the eastern horizon, November 24, 2013. Note that this is an artist’s rendering, and that the comet may not look anything nearly this bright/prominent. For Northern Hemisphere observers, the predictions are that the best time to view Comet ISON through binoculars this month will be on the mornings of November 24 and 25 (see image above). Face east and look for the two bright points of light, which are the planets Saturn and Mercury, just above the rising Sun. 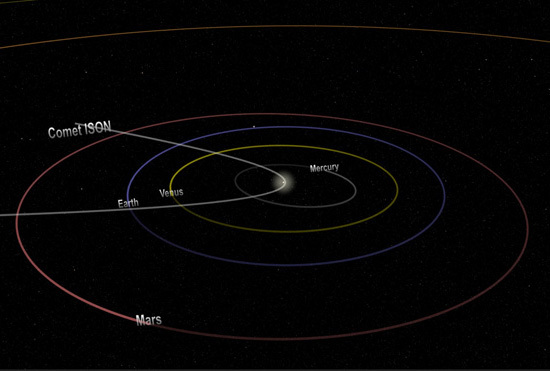 ISON will be just to the south of those planets. Be careful not to view the comet after the Sun rises: The comet is so close to the Sun that you could accidentally look at the Sun, which could seriously damage your eyesight. View from the Southern Hemisphere of Earth (Australia, New Zealand, South America, Africa…): Comet ISON shortly before sunrise, over the eastern horizon, November 22, 2013. Note that this is an artist’s rendering, and that the comet may not look anything nearly this bright/prominent. For Southern Hemisphere observers, the predictions are that the best time to view Comet ISON through binoculars this month will be on the mornings of November 22 and 23 (see image above). Face east and look for the bright star “Spica” in the Name A Star Live constellation Virgo. ISON will be just to the south of that star. You’ll probably need a pair of binoculars to find the comet. Be careful not to view the comet after the Sun rises: The comet is so close to the Sun that you could accidentally look at the Sun, which could seriously damage your eyesight. Again, how the comet will appear in December depends on how the comet is affected by the Sun when it flies by the Sun on November 28 (November 29 for those of you in the Eastern Hemisphere of Earth). 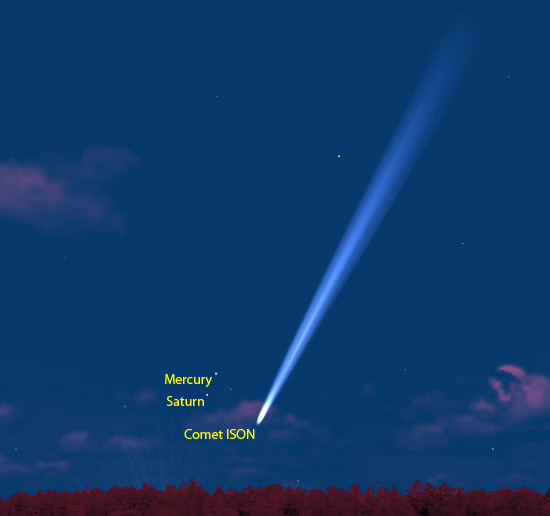 Visit this blog in early December for information about viewing Comet ISON that month.